I buy almost all of my produce at the farmers market. It’s the only place I shop on a weekly basis. There are so many benefits that come from this direct producer-to-consumer arrangement. Here are some of the things I love most about the farmers market. Price. The organic produce I buy at my farmers market is the cheapest organic produce I can buy. If you are trying to figure out how to make eating organic more affordable, this is one of my best suggestions. Taste. Even if you can find cheaper produce elsewhere, the farmers market almost certainly sells the tastiest produce you can buy. The produce I buy at the farmers’ market is fresher and tastes better than any produce I can buy at the grocery store. Often picked the day before, you cannot beat the freshness of the farmers market. I’ve noticed that produce I buy there lasts much longer than produce I purchase in the store (which probably spent weeks in storage/transportation). Environment. Shopping at the farmers market allows me to buy local seasonal foods that require fewer fossil fuels to produce. When I buy food at the farmers market, I’m giving my entire food dollar to the farmer (according to the USDA, for every dollar Americans spend on food, less than 16 cents goes to the farmer; the other 84 cents goes to marketing). Supporting local farmers helps to promote a local food economy, healthy agricultural land and open space where I live. By bringing your own reusable shopping and produce bags to the farmers market, you can purchase groceries without any packaging waste, further reducing your food’s footprint. Many containers, such as berry baskets and egg cartons, can be returned to farmers for reuse. Special bonus: no annoying tiny stickers on your produce! Just Food. Farmers markets are the anti-Super-Walmart. I like to buy my produce fresh and often, so it is wonderful to have a place where I can shop for just produce and nothing else. No sales displays. No packaged junk food tempting your will-power. Just produce (and maybe some bakery bread, pastured eggs, locally raised meat, or handmade soaps depending on your market), plain and simple. I hope I’ve convinced you to visit your local farmers market. 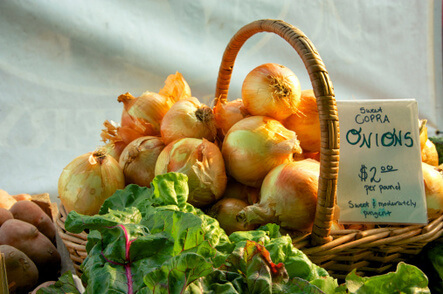 Stay tuned for posts all week about how to get the most out of your farmers market. What do you love most about the farmers market? Betsy Escandon is a mom of three young children, an occasional policy analyst and the author of the blog Eco-novice: Going Green Gradually, where she chronicles her eco-successes and failures.